that he went through the corn fields: The KJV’s “corn” is likely misleading to American readers since the grain would have been wheat or barley and not maize, which is a New World crop and was therefore unknown to the biblical world. 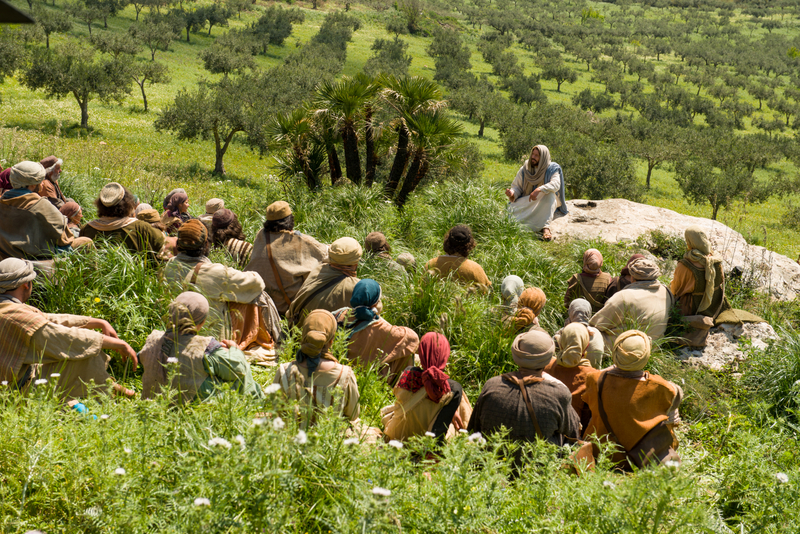 The normal practice would have been for Jesus, as the teacher, to walk in front of his disciples. While it is possible that the passage conforms to that custom, it is more likely that the text pictures the disciples walking ahead of Jesus. to pluck the ears of corn: There is a textual variant here: this passage probably first read that they began “to make a way by plucking,” meaning that the purpose of plucking the grain was to clear a path through which they could walk. It appears that some later manuscripts changed it to “to pluck,” probably because there seemed to be a discrepancy between what they were doing (plucking to clear a path) and Jesus’ explanation (plucking to eat because of hunger). They were making a path for Jesus. Evidence for this reading includes: A. In 2:23, the grammatical emphasis seems to be on making a way, not on eating. B. The phrase “as they went” can mean “to create a road.” C. No one is described as eating and the story does not say that they were hungry. D. Jesus himself apparently does not pluck the grain, just the disciples. Making a way would be the role of the disciples. E. This reading fulfills the Isaiah prophecy quoted in 1:3 (“Prepare ye the way of the Lord, make his paths straight”). Ironically, the Pharisees miss this important moment because they are focused on (their interpretation of) the Sabbath rules. F. A Jewish tradition that may have been extant in Jesus’ lifetime (although there is no written record of it until later) grants kings the right to make a road through any property. If this practice were on Mark’s mind, it would suggest an element of royal imagery in the story. G. If the disciples were walking in front of Jesus, then it emphasizes his “royal authority, since royal visits were often prepared for by roadworks.” H. It makes better sense of the David story, which is not about activity prohibited on the Sabbath but rather about the special prerogatives of kings. The point of the David story is that very special circumstances justify violation of the law; it is probably easier to locate similar circumstances in the need to further Jesus’ ministry than in the physical desire to eat. They were hungry. Evidence for this reading includes: A. In the David story, his men are hungry, not creating a path through a field; by analogy, that reading would be more likely here. B. In Matthew’s and Luke’s uses of the story, (Matt. 12:1; Luke 6:1) the disciples’ hunger (Matthew) and the eating of the grain (Luke) is specifically mentioned. (Of course, it is possible that they understood this story differently than Mark did.) C. The idea of plucking grain to make a path does not make sense on a logical level since removing the heads of grain would not create a path; the stalks would need to be removed as well. It is possible that there are two layers of meaning here—a literal level of hunger and a more symbolic level (perhaps created by or expanded upon by Mark) of making a path. 2:24 And the Pharisees said unto him: It is possible that the presence of Pharisees in the middle of a field is another example of Mark’s irony if they are thought to be violating the Sabbath. But it is also possible that the Pharisees’ behavior is within their interpretation of the law if they were neither picking grain nor walking farther than was permitted. It is likely that they direct the question to Jesus (and not to the disciples because a teacher was considered responsible for the behavior of his students. Behold, why do they on the sabbath day that which is not lawful? : The law of Moses prohibited work, including reaping, on the Sabbath (Ex. 34:21). If the disciples were creating a path, that also would have been forbidden and may have further offended the Pharisees by its equation of Jesus with the royal one who had been promised by the prophets. The Hebrew Bible mandated death for Sabbath violations (Ex. 31:14–15); later Jewish tradition required a warning before that penalty was imposed. It is possible to read this question—which is not a simple request for information but rather an attack phrased as a question—as the warning tradition required. 2:25 And he said unto them, Have ye never read: The Greek form of this question presumes an affirmative answer. Of course the Pharisees would have read this story; the point behind Jesus’ question is that they had not understood or applied what they had read. what David did, when he had need, and was an hungred, he, and they that were with him? : See 1 Samuel 21:1–6. 2:26 How he went into the house of God: At this time, the “house of God” would have been the tabernacle. David, who was not a priest, should not have entered into it. It did not refer to the time of the high priest but rather to the section of the scroll where the story about the bread could be found. It is likely that the text is in error; the other theories come mostly from those committed to the inerrancy of scripture. While the error is not terribly significant, it does raise an interesting question: Does the mistaken referent stem from Jesus or from Mark (or his source)? If it was Mark’s or his source’s error, then this is an instance where Mark did not correctly record Jesus’ words. If it was Jesus’ error—an option most LDS would not find acceptable, although perhaps some readings of Luke 2:52 (“and Jesus increased in wisdom”) would permit such a position—then that speaks to the nature of his mortal limitations. and did eat the shewbread: On each Sabbath, twelve loaves of bread (KJV: “shewbread”) were placed on a table in the tabernacle (and, later, in the temple). At the end of the week, the old loaves were given to the priests (Lev. 24:5–9). It is Mark’s aside to the audience to explain an unfamiliar Jewish custom or to emphasize the key element of the story. It is part of what Jesus says to the Pharisees, who would have been well aware that it was not lawful for the laity to eat this bread; Jesus would not have been providing new information but rather highlighting the point of the story. Either way, the phrase concedes the point that it was unlawful for the disciples to pluck the grain—the issue is not what constitutes a violation of the law but rather whether this situation justified violating it. The main issue here is not what is or is not done on the Sabbath, but rather Jesus’ authority: if David was allowed to do something contrary to the rules, then how much more should Jesus be allowed to since, as will soon be seen, he is the Lord of the Sabbath. and gave also to them which were with him? : This statement creates something of a conundrum because, contrary to these words, it does not seem that David’s men were in fact with him, and there is no record in 1 Samuel of him actually sharing the bread with them. David refers to having men with him (1 Sam. 21:2), but this seems to be more of a ruse than a fact. In 1 Samuel 21:4, the priest’s objection is not that David is not a priest, but rather his answer implies that David and his men can eat the bread as long as they are ritually pure. Both Leviticus 24:9 and Mark’s text imply that the bread is restricted to priests only. Jesus’ story refers to Abiathar, but the priest in 1 Samuel 21 is Ahimelech. Jesus was recounting a different story, one with many similarities to 1 Samuel 21, but nonetheless a different incident. There are many pairs of stories in the HB where two different events are narrated with significant overlap between the stories. In this case, Jesus would be relating a story not otherwise preserved in the HB. Jesus was familiar with a version of 1 Samuel 21 that was quite a bit different from the extant record (although the same historical incident was behind his account and 1 Samuel 21). 2:27 And he said unto them: Sometimes Mark uses this phrase to introduce a completely separate saying, so it is possible that this material was included here not because Jesus said this immediately after what he said in 2:26 but because Mark felt it fit in with the theme of Sabbath observance. The sabbath was made for man: Jesus’ statement contains an important insight about the Sabbath: the Sabbath was created. It is perhaps unusual to think of the Sabbath as a created entity, but this language, as well as the creation account in Genesis 1–2, encourages this view of the Sabbath. God’s powers extend not only to the creation of objects but to sacred time. and not man for the sabbath: This phrase is probably best read as another example of dialectical negation, meaning that the negative term is not completely negated but the positive term is emphasized. The “therefore” implies that Jesus is still speaking, and 2:28 is the conclusion that he draws from his statement in the previous verse. The “therefore” signals that this is the conclusion that Mark is drawing from Jesus’ words. So Mark, and not Jesus, is the speaker here; Mark felt the need to explain to his audience what conclusion they should draw from Jesus’ statement in 2:27. “Son of man” refers to any human being. Because the Sabbath was created for man, each person is therefore lord (or master) of the Sabbath, with the right to determine what is or is not appropriate on the Sabbath. Support for this reading includes: A. The question is the behavior of Jesus’ disciples—not Jesus himself—on the Sabbath; thus, the issue is the privileges of the disciples. In that context, it makes more sense to see this passage as suggesting that all disciples—and not just Jesus—are masters of the Sabbath. B. Because Jesus uses a story rooted in David’s special prerogatives as king to justify his disciples’ behavior on the Sabbath, the implication is that Jesus’ followers have the same rights as kings and priests. “Son of man” refers to Jesus. In 2:28 Jesus (or Mark) is explaining that he has the authority to determine what is proper Sabbath observance. Support for this reading includes: A. Mark usually uses the phrase “Son of man” in the context of Daniel 7 (2:10), which refers to one special figure who is given authority, not to humans in general. B. “Son of man” probably would not have had an article (“the Son of man” versus “a son of man”) if it meant any human.61 Because it has the article in this case, it refers to Jesus. C. In Jesus’ own time, “Son of man” could have referred to any human, but by Mark’s time, and for his audience, it is a title for Jesus. Therefore, Mark would have needed to provide some explanation if he intended it to refer to a particular person. is Lord also of the sabbath: “Lord” is an acceptable translation here, but so is “lord” (lowercase and thus not a reference to Jesus but to anyone acting in a ruling capacity) or “master,” which may be preferable in this context, since the idea is that the Son of man is the master of the Sabbath. In the Hebrew Bible, “God is the Lord of the Sabbath because he instituted and consecrated it.” Once again, Jesus is subtly identifying himself with the God of the HB. Jesus’ Three Answers. When presented with a question about plucking grain on the Sabbath, Jesus offers three separate answers: David’s story, the saying about the Sabbath being made for man, and the statement about the Son of man being the Lord of the Sabbath. (It is also possible to parse this as two answers instead of three, with the “Lord of the Sabbath” saying as the conclusion drawn from the fact that the Sabbath was created for man and therefore part of that saying.) Why did Jesus offer more than one response? The David story was an incomplete answer and therefore required more explanation. The David story is an argument from scripture, while the two other answers are logical explanations. It is likely that Mark’s material is not in chronological order; it is therefore possible that the second or third answers were delivered at other points in Jesus’ ministry but were placed here because they fit the theme of Sabbath observance. Relationship to 2:13–17. There is likely a chiastic arrangement in this group of five controversy stories, which means that this story should be compared with 2:13–17. Both stories concern discipleship, eating, and the observance of the law. Both imply that Jesus’ authority permits his disciples to behave in ways contrary to expectations. The chiastic structure thus emphasizes the issue of Jesus’ authority. Relationship to 2:18–22. There is a compelling tension between this story and the previous one: here, Jesus uses an example from the HB as a guide to proper behavior. In the last story, he taught that the “old” and the “new” should not be mixed. Clearly, he did not consider the HB part of the old; perhaps Mark juxtaposed these stories to make precisely that point. When confronted about his disciples’ behavior, Jesus compares himself to David and thus alludes to his role as the Davidic Messiah. Jesus implies that he has the same status as David because of his similar ability to be exempt from a law as special circumstances require. If the purpose of plucking grain was to make a path, then royal themes are emphasized and Jesus is pictured as the king for whose royal visit a road is made. In 1 Samuel 21, David is taking on the role of the priest by eating something that only the priest should eat, so David is acting as both priest and king. This dual role might explain why Jesus chose this story despite the fact that the incident is not a perfect parallel to his situation. In a sense, the real issue here is not Sabbath observance but Jesus’ authority to determine what constitutes appropriate Sabbath observance. The emphasis on Jesus’ authority is heightened by the fact that the story does not portray Jesus himself plucking or eating but permitting his disciples to do so and then defending them when they do. Bratcher and Nida, Translator’s Handbook, 97. See the Notes on 2:17 in this book.